﻿﻿If you would to take a punt on the ponies without risking your own money, SkyBet is your best option. Everyone who creates a new account gets a £10 no deposit free bet. Plus you get a £5 free bet every week. ﻿﻿The Racing Post is the most popular racing app on the market today. Not only does it offer racecards, results, radio commentary and news, it also has a very comprehensive tipping section. When viewing the racecard for an individual race just select the "Tips" tab to quickly see how many times each horse has been tipped by various publications and racing experts. The tips section displays a digest of tipster selections from newspapers such as The Guardian, The Times, Daily Mail, The Sun, Daily Mirror, The Express and The Star. OLBG is an online betting tips and advice community. They have now produced an iOS and Android app that brings this expertise to the iPhone, iPad and iPod Touch. 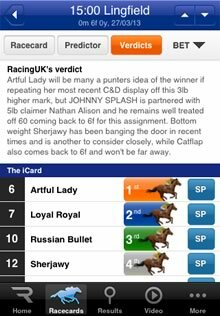 With the OLBG app you can see the most heavily tipped horses on any given day. You can also see how many people are tipping the race and what percentage are tipping individual horses. The comment section allows tipster to leave their verdict and there is also an option to view additional information on the main website. 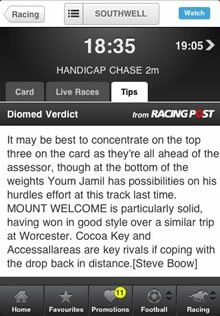 ﻿﻿What we really like about Paddy Power Mobile for iOS, Android, Windows Phone and BlackBerry is that they have somehow negotiated a deal with the Racing Post to all the same detailed impartial betting advice you'll find in Racing Post app. This means that you don't need need to switch apps if you want to place a bet because it's all there right inside the racecard. PaddyPower also offer exclusive betting tips from top jockeys like Ruby Walsh, A.P. McCoy, Barry Geraghty, Richard Jonson and a whole host of other racing insiders. 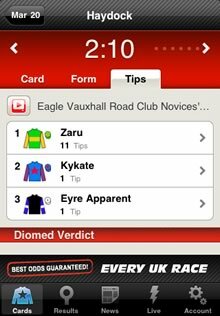 The free version of the Racing U.K. app for iOS and Android contains a pretty comprehensive tipping area. 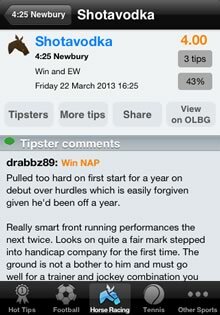 There is a "Today's Tips" section that contains Racing UK's "Nap of the day". Via the Racecards section you can access the "Predictor" that predicts the placing of every UK, Irish and South African race based on 60 different form parameters, including the going, the race distance, the trainer and jockey form and how each horse has performed on that particular course.